$775 for a table of eight. 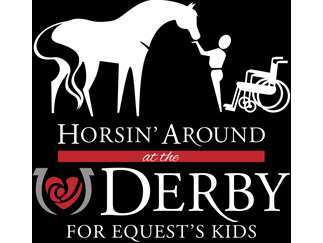 "...In a Race for Health Hope and Happiness"
The Horsin’ around at the Derby for Equest’s Kids will be held Saturday, May 4th from 4:00-9:00 pm at the Equest Center for Therapeutic Riding in Rockford. 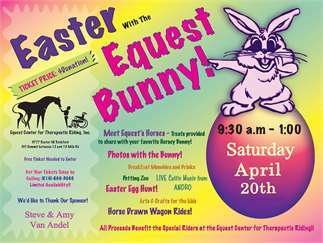 Join the winning tradition of Equest Center for Therapeutic Riding with Mistress of Ceremonies “Maranda” from WOTV4 and more than 350 distinguished guests from the greater Grand Rapids community at a very special afternoon and evening salute to The Kentucky Derby and the horses and riders of Equest Center! If you can’t be in Kentucky, this is the best place to be! This extraordinary derby event will be filled with everything the Run for the Roses is known for; from Derby hats, to Mint Juleps and delicious Derby cuisine! The Race! Guests of this charity event will not only be able to watch a LIVE simulcast viewing of the big race, but will also be able to enjoy a unique opportunity to “play the ponies” to benefit Equest’s kids! Come and delight in the live auction packages and surprises of the evening! Double your donation to Equest Center through a DOLAR-FOR-DOLAR MATCH offered exclusively at the event! Cost: $100 per person $775 for a table of 8 Corporate sponsorships available!